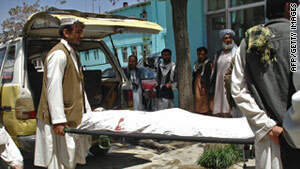 A victim's body is carried through Ghazni, Afghanistan, after Sunday's attacks. (CNN) -- A 12-year-old suicide bomber killed three other people, including a district council head, and armed attackers shot to death two police officers Sunday, the first day of a Taliban spring offensive. The attacks followed a Taliban declaration Saturday that its spring military operations will focus on attacks against military bases, airbases, convoys, heads of foreign and local companies, and members of the local government. In Shaken district of Paktika province, the 12-year-old boy detonated explosives in his vest to kill district council head Shernawaz Khan and two others, said Mukhlis Afghan, a spokesman for the Paktika provincial governor. The blast also wounded 12 people, Afghan said, adding: "The suicide attacker's aim was to target the district council chief." In a separate attack, armed men opened fire on police in southern Ghazni province, killing two police officers, provincial police security commander Abdul Hassan said. According to Hassan, two armed Taliban insurgents on a motorbike opened fire on police officers and then fled the area. In its declaration Saturday, the Taliban warned that it also would target members of the High Peace Council, who are influential citizens trying to generate dialogue with the militants. "All Afghan people should bear in mind to keep away from gatherings, convoys and centers of the enemy so that they will not become harmed during attacks of the Mujahedeen against the enemy," the statement said. The Taliban said that "strict attention" must be paid to protecting civilians. "Utilizing all proven military tactics, the operations will focus on usage of advanced weapons against the air and ground forces of the invaders, tip-and-run attacks, and group offensives, city attacks, advanced explosives attacks, effective group and martyrdom seeking attacks by warrior Mujahedeen," the statement said. However, the deployment of a young suicide bomber Sunday appeared to contradict a Taliban statement that the insurgents intended to avoid using civilian attackers. "I would like to announce that (the) Islamic Movement is committed to pay extra attention for not arming civilians during their operations on the enemy's targets across the country," Taliban spokesman Zabiullah Mojahed said in an e-mail to CNN. The Taliban regime in Afghanistan had been sheltering the al Qaeda terror network when it launched attacks against the United States on September 11, 2001. The United States cranked up military operations the next month that led to the toppling of that government. Ever since, international forces have been fighting Islamic militants in Afghanistan and Pakistan and attempting to support and build the successor Afghan government. The Taliban announcement comes a day after a NATO official said the alliance anticipates insurgents to begin an extensive round of attacks against U.S. and coalition forces "in the coming days." The officer with NATO's International Security Assistance Force noted that the alliance has seen similar surges at this time in recent years. The coalition feels that the increased attacks on insurgents have had an impact, and new attacks by insurgents signal their effort to recoup their losses, the officer said. In a statement Saturday addressing the expected escalation in fighting, the U.N. Assistance Mission in Afghanistan urged all parties to avoid harming civilians. Staffan de Mistura, head of the mission, called on the Taliban "to carry out their previously stated decision to avoid civilian casualties." "Parties to the conflict must not deliberately attack, target or kill civilians, or indiscriminately harm them," said de Mistura, who was quoted in the statement. "We call on all parties to take all possible measures to protect civilians, especially in the forthcoming months when we expect, unfortunately, intensified conflict." In the 90 days ending April 22, coalition special forces conducted 1,393 operations, capturing or killing 468 insurgent commanders, and capturing or killing 2,637 lower-level insurgents. This all comes as the Pentagon released its latest report to Congress on the progress in Afghanistan. The military says gains made in Afghanistan over the last half year has created the "necessary conditions" to begin transferring control of security to the Afghanistan government in seven areas of the country inhabited by approximately 20% to 25% of the population. The latest semi-annual report concludes that insurgent momentum has been halted in much of the country, though the gains are "fragile and reversible." However, the report notes that efforts to fortify government and development was "slower than security gains" over the last six months. The total number of security incidents were higher from October 2010 through March 2011 compared with the same period of the winter of 2009-10, the report said. The report says this is mainly due to increased coalition and Afghan troop presence, which allowed for a higher pace of operations against insurgents' safe havens. CNN's Adam Levine, Barbara Starr, Fazel Reshad, Matiullah Mati and Joe Sterling contributed to this report.